This morning the Home Office published the statistics on animal research for 2009 , and they make interesting reading. One change is that after a decade which has seen a steady rise in the number of animals used, and a sharp rise of 14% in 2008, the total number of procedures performed fell by 1% to just over 3.6 million. The rise in 2008 and subsequent fall in 2009 may represent a statistical blip, but it may also reflect the impact of the recession as projects were moved forward in anticipation of reduced funding in the future. With government funding of all scientific research in the UK facing cuts of up to 25% in the years ahead, it is likely that we will see further falls, since government funding through the research councils pays for about a third of projects involving animal research. After all, the increase we have observed over the past decade was due to a large extent to increases of about 50% in real terms in spending on biomedical research by the government, and we cannot now expect animal research to be immune from funding cuts. A lot will depend on whether spending by medical research charities and industry, which account for the remainder of the funding and also saw large increases in the past decade, can fill the gap left by government spending cuts. One milestone passed this year was that for the first time over 50% of procedures involved the breeding or study of genetically modified animals (mainly rodents), which reflects a trend that we have noted before and reflects the growing importance they have to fields as diverse as cancer research and developing treatments for Duchenne Muscular Dystrophy. One comment that stands out in the statement by Home Office Minister Lynne Featherstone is that the Government is“committed to ending the testing of household products on animals”, a frequent demand of animal rights groups. This would seem to be an easy promise to fulfill since, as our friends at Understanding Animal Research have pointed out, no such tests were performed in 2009, and very few, or none, in previous years of the past decade. The safety testing of household products on live animals has effectively already been ended by changes in the regulatory framework for chemicals, for example to the European REACH regulations and the recent development of alternatives that use cultured cells or tissues from dead animals and are sufficient for the evaluation of most cosmetics or household products. This is a perfect example of the 3Rs in action. Overall this is a report that reflects both the profound changes that are happening in how and why animal research and toxicity testing is done, and the challenges facing British science as a whole in this time of austerity. Turning to the activities of animal rights campaigners, we find that the Leicester Mercury has noted the tendency of a campaign by the National Anti-Vivisection Alliance* against a new laboratory at the University of Leicester to be economical with the truth. This will be no surprise to those of us who have been watching NAVA’s increasingly desperate attempts to stir up opposition to the new laboratory in Leicester, but will I’m sure be an eye-opener for Leicester citizens not yet familiar with degree to which some animal rights groups will misrepresent and distort the truth to advance their cause. Great news from HIV microbicide trial - thank the monkeys! 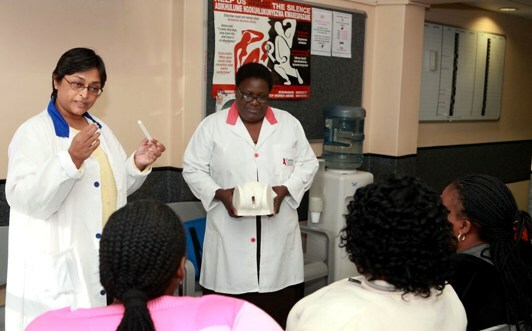 There was exciting news on Monday when it was announced at an international AIDS conference in Vienna that microbicide gel had dramatically reduced the transmission of HIV in a Phase 2 clinical trial involving 889 women in South Africa. If confirmed by larger phase 3 trials this gel will offer millions of women a way to protect themselves against this dread disease that blights communities around the world. Unlike previous microbicide gels that failed to offer significant protection against HIV infection this gel included the anti-retroviral drug tenofovir. Tenofovir was one of several anti-retroviral drugs discussed in an article on the role of non-human primate research in developing HIV prophylaxis by virologist Dr. Koen Van Rompay that was posted on the Speaking of Research blog last year. Dr. Van Rompay’s article looked at the use of oral tenofovir in pre- and post-exposure prophylaxis rather than its use in a microbicide gel. So did the research on preventing SIV transmission in monkeys influence the decision to use tenofovir in this microbicide gel? You betcha! In the first report of a Phase 1 trial of this tenofovir-containing microbicide gel published in 2006 (1) the authors state that the success of tenofovir in preventing SIV infection on monkeys – the same research discussed by Dr. Van Rompay – was a deciding factor when they took this gel into clinical trials. "Tenofovir gel, 9-[(R)-9-(2-phosphonylmethoxyprophyl) propyl]adenine monohydrate, a nucleotide reverse transcriptase inhibitor, has demonstrated ability to inhibit retroviral replication in animals and humans, and it has been well tolerated when used orally, as tenofovir disoproxil fumarate, (tenofovir DF; Viread) [16–20]. Tenofovir DF has been approved for treatment of HIV-1 infection and is increasingly used as part of therapeutic regimens for HIV-positive individuals . Tenofovir has been proven to be effective in blocking the transmission of SIV in animal models when given as pre- or postexposure prophylaxis systemically or when applied as an intravaginal gel [22–25]. Tenofovir bisphosphate, the active intracellular moiety, has a very long intracellular half-life (> 72 h), which could allow for more convenient, coitally independent intravaginal use . Given the data showing animal protection with tenofovir gel, and the extensive human safety data with oral tenofovir in HIV-positive patients, the HIV Prevention Trials Network (HPTN) decided to assess the safety and tolerability of tenofovir gel in HIV-negative and HIV-positive women and their male sexual partners (HPTN 050)." The above passage also mentions that they tested whether the microbicide gel containing tenofovir could prevent vaginal SIV transmission in monkeys*, and the finding that it could drove their subsequent decision to take the gel into clinical trials. This was an important decision, a review of HIV microbicide gels published in the journal Science (2) two years ago pointed out the failure to evaluate other microbicide gels in monkey models of HIV transmission allowed these gels to proceed into clinical trials where they subsequently failed. It is notable that the microbicide PRO 2000, also evaluated in monkeys, is the only other microbicide to demonstrate an ability (albeit less dramatic) to prevent HIV infection in clinical trials. So what now? Well the tenofovir containing gel will go on into larger phase 3 trials to further evaluate its ability to prevent HIV infection in women. In the meantime following a study showing that it can prevent the transmission of rectal SIV transmission in macaques (3) this gel is now in phase 1 safety trials in men. This is welcome news after years of disappointment, and further evidence that where HIV is concerned there can be no shortcuts; all therapies whether microbicide gels or vaccines must be thoroughly evaluated in stringent animal models before being taken to human clinical trials. Perhaps now we can start to turn realism into optimism. In other good news, Mel Broughton, former spokesperson for the animal rights group SPEAK that waged an often vicious (though occasionally bizarre) campaign against the new biosciences laboratory at Oxford, was jailed for 10 years last week for conspiracy to commit arson. The unanimous verdict highlights once again how closely so-called "above ground" extremist campaings such as SPEAK and SHAC are connected to the criminality of those who operate under the banner of the ALF. Hopefully this verdict and sentence, along with the failure of Broughton's campaign to prevent the completion of the new laboratory, will help to dissuade other activists from resorting to such terror tactics. * Unfortunately this study was never published in the scientific literature, this is something that sometimes happens with pre-clinical studies performed by biotechnology and pharmaceutical companies…usually because they wish to keep the work confidential for commercial reasons…and is a source of great frustration to people like me who write about this work! 1) Mayer K.H. et al. “Safety and tolerability of tenofovir vaginal gel in abstinent and sexually active HIV-infected and uninfected women.” AIDS. volume 20(4), pages 543-551 (2006), DOI:10.1097/01.aids.0000210608.70762.c3. 2) Grant R.M. “Whither or wither microbicides?” Science. Volume 321(5888), pages 532-534 (2008), PubMed Central:PMC2835691.